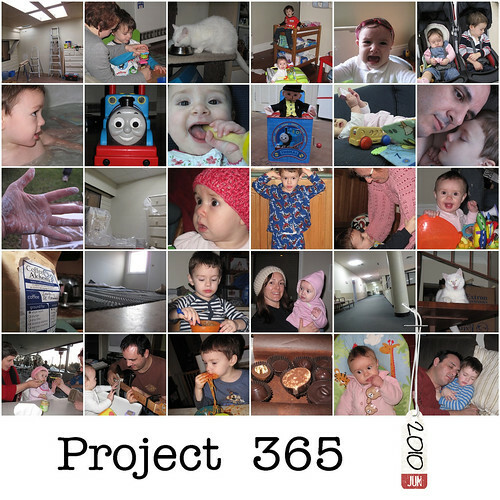 What is Project 365 (P365)? Project 365 is actually really simple … it is just the act and self-discipline of taking one photo a day for a whole year. It can really be that simple. But like many things that seem really simple … they don’t often end up being necessarily easy. I completed it in 2010 and really enjoyed it. LittleMiss was only a couple of months hold and LittleMan had just turned 2. My project in 2010 was alittle more complicated (but that was entirely my choice). I wanted to take 1 photo a day my two children. It made it harder (and trust me there are a few photos of them in bed at night asleep when I had gone … “bugger I have forgotten to take the photo” … and raced into their bedroom before the midnight cut off) … but also incredibly rewarding. I have so many pictures and you can really see how they change and grow over the year … especially with LittleMiss when they change so much in the first year. It was hard work (and I only missed 6 days) but the reward was worth it in the end. But how does Project 365 relate to Instagram? Well … my first tip for anyone thinking about doing Project 365 is to always have your camera with you at all times. If you don’t be prepared for Murphy’s Law to strick with a vengenance … at just the moment you think you could take the best photo you won’t have your camera. This is where your Phone and Instagram comes in. Most people take their phones everywhere and even compared to a few years ago the cameras in phones have improved incredibly. I am not saying that they are the same as a DSLR but most new cameras on the market have a 8MP camera. That is pretty darn good for a phone if you ask me. So it makes it just perfect for Project 365. While there are many phone photography apps out there. I think that Instagram is the best and has risen to be the most popular photography app for the iPhone (and I think android market). I have a few photography apps on my phone but I would have to say that Instagram is my favourite … and I use it everywhere. I love the filters it has, I love its sharing and community, I love how easy it is to share with Facebook and Twitter … and also update on my blog. For me it is great. So for doing Project 365 where I have my phone with me all the time and I enjoy using Instagram it just seemed to make sense. But is that all there is to Project 365 and Instagram … taking a photo each day? Well it can be. That is one of the things I love about Project 365 is that you can make it really anything you want it to be. However for me the 2 things I like to get out of it are … improving my photography (and that is why I will be taking some photos with my ‘normal’ camera) and sharing with others. The sharing component with Instagram is one of the reasons I want to do Project 365 using that app and one of the easiest things you can do is use the hashtags to be able to share you photos with others (including those that you don’t know … yet). People who are familar with twitter will know all about hashtags and they work in the same way. So how do I use hashtags? The idea here is not to tag every single word, only the most relevant and important. Adding a hashtag on your cat called Kitty is probably not very relevant for searches; it would be better to add keywords such as #pet or #pets. With the comment of a picture: – I often use this one as I like to pick which picture of mine at the end of the day is my ‘pic of the day’. So I use the comment for my hashtags. What else can I do with Project 365? For me I like to do a few things with my Project 365 photos … here are some ideas on how you can make the most of the photos that you collect. Check out the Project 365 group on Flickr. It is a great community of people to share photos with and get some inspiration. Here you will also find some old hands who have done it for several years. Hipstamatic – My 2nd favourite photography app. I have lots of fun with all the different options and combinations … sometimes I use Hipstamatic to take the photos and edit … and then use Instagram for the share. Project 365 Remember Your Year One Photo At A Time – (watch out there are 2 with the same name … the one I like has the camera as part of the logo. Not the one with the yellow background) I have only just downloaded this app. It costs $0.99 and it is worth it. Great way to collect your photos in one place and see them from a calendar perspective, has a reminder to alert you to take a photo (I set mine to 1pm … so plenty of time to remember) and also can share via email, facebook, twitter and flickr. I hope that this has been helpful … and if you are doing Project 365 (or Project 366 this year) … Project 52 (just one photo a week) … Please let me know. I would love to see what you are doing… Also if you any other apps, tips or tricks you think are useful I would love to hear … Good luck in 2012.